The wife and I were at the road-show of Living 180 University - quite a mouthful for a project name, so we shall shorten it to L180U for convenience sake - last weekend. This is a residential project located above the Shangri-la hotel in Toronto, Canada. L180U is a freehold project consisting of 395 residential apartments. It is housed in the same building as the Shangri-la Toronto, which standing at 214 metres, is one of the ten tallest building in Toronto. Shangri-la was also the second deepest excavation for a building in Canada's history at 102 feet (31 metres). This was done to create 8 levels of basement parking for the building. Shangri-la hotel itself occupies the first 17 floors of the building. The residential component are housed on the 18th - 67 floors and consists of 2 category of units - the "Residences" from Floors 18 - 49 and the "Private Estates" from Floors 50 - 66. The primary difference (other than price point) between the 2 category are (1) Dedicated lifts that served the "Private Estates" units and (2) Higher quality furnishings and fittings (from Dornbracht, Miele, Sub-Zero and Kohler etc.) for the "Private Estates" units. This is similar to the make up of Vancouver House. The "Residences" units were fully sold to local residents in Torontoback in 2011-12 but Westbank had decided to hold back on the release of the higher-floor "Private Estates" units. Developer felt that they can fetch a higher price for these "premium" units once the building is completed and occupied. They have only decided recently to put the remaining 60 units in L180U for sale to foreign buyers. Singapore is supposedly the first stop of their Asian road-show and they will be heading to Hong Kongin 2 weeks' time. Location wise, L180U is located within Downtown Toronto along University Avenue. This is the main avenue leading to The University of Toronto, which is either a 2-subway stop or 15-minutes walk away. LU180 is sandwiched between the Central Business District (where most of the major banks and financial institutions are found) on one side and the Fashion District - a popular shopping area that sells clothing directly from manufacturers - on the other. 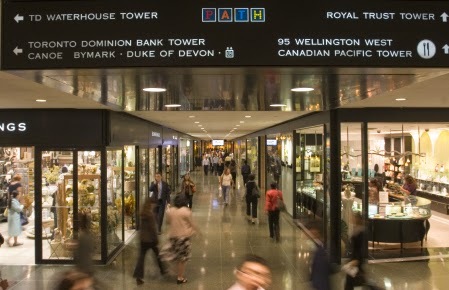 And underneath the building is PATH - the largest underground shopping mall in the world according to the Guinness Book of Records - with 4 million sqft of retail spaces! · The larger apartments (i.e. 1,900sqft and above) comes with their own "private parking garage" in the basement - they get 2 dedicated parking lots that come with shutters that can be open/shut for privacy. Pricing wise, the smallest unit currently available is a 1386sqft, 2-bedroom apartment selling at CAD1,574,600. This translates to about CAD1,136psf. There were supposedly 2 units of one-bedders for sale but these had been snapped up by a single buyer at the beginning of the road-show. The next smallest unit is one of about 1500+sqft (also 2-bedder) while the rest are 3-bedders or more that are in excess of 1800sqft. · Location - being right smack within Downtown Toronto, accessibility and convenience are key selling points. Toronto, together with New York and London, are considered the Top 3 financial centres in the Northern Hemisphere. And at CAD1,136psf (less than S$1,400psf), one can forget about buying an apartment in our own downtown CBD! · The gross rental yields in Downtown Toronto averages about 6% p.a., while capital appreciation averages around 8 - 10% p.a. One may certainly get higher returns elsewhere (like Brazil, allegedly) but we consider the return for L180U decent especially by Singaporean standards. Even if one takes a loan, the 3% nett yield after mortgage repayment (interest rate at around 3%) is still not too shabby. · Westbank (the developer) is providing a rental guarantee of 8% p.a. for the first 3 years of purchase - the rental payment starts from the first month after purchase, irrespective of whether the unit is tenanted or vacant. This provides immediate rental income that is above market average at least 3 years. · The Shangri-la branding, which is an endorsement of the quality of L180U. We reckon that Shangri-la will probably not want to associate itself with a sub-par project. · We like the spacious units and the view from the apartment is promised to be quite spectacular. · As L180U is a "move in" project, the terms of payment is rather severe - you have to put 10% down 7 days after the execution of the S&P with balance due at closing of the purchase. This means that the full purchase amount is payable within 3 months of execution of S&P. And given the bigger purchase quantum (in view of the larger-sized apartments) and a maximum of 65% loan available from Canadian banks (no Singaporean banks will provide financing for Canadian properties), the financial outlay may be too much/too quick for many prospective buyers. · Some market analysts have indicated that chances of a steep fall in Canadian home prices have increased in the past year, particularly for Torontoand Vancouver. This is because house price increases have significantly exceeded income growth. There is also the added concern of increasing supply of condos especially in downtown Toronto. However, the same have been said about the London market for years and prices are still rising albeit at a slower pace. 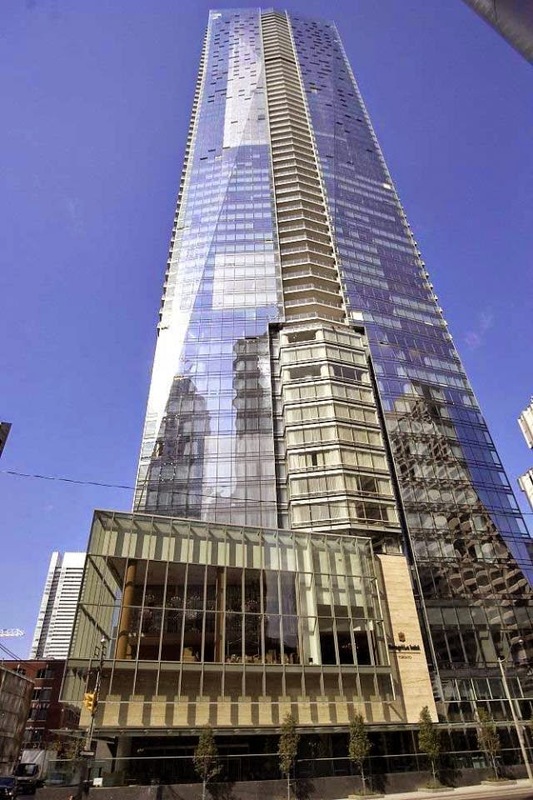 · The wife and I have read about several instances of glass panes falling from Shangri-la Toronto over the past 2 years - the latest incident happened as recently as July of this year. Hopefully the problem is fixed now. Disclaimer: This is NOT an advertorial and we are not helping anyone to sell anything here. So Caveat Emptor! No Comment to " Living 180 University @Toronto, Canada "